Next time you have to write an exam, remember a lot of information or answer difficult questions, spend a few minutes beforehand thinking about the concept of intelligence. What are some synonyms for intelligence? What behaviours are characteristic of it? After five minutes of this, you should do noticeably better on your mentally challenging task. Yes, I’m serious. And you’re welcome. Research done by Ap Dijksterhuis and Ad van Knippenberg in the Netherlands showed that thinking about intelligence or about characteristics of a stereotypically intelligent person (a professor) for five minutes significantly improved study participants’ scores on general knowledge tests. On the other hand, spending time thinking about stupidity or about the characteristics of a soccer hooligan reduced their scores. Students playing a money-sharing game played more selfishly when they were sitting at a table on which were a briefcase, an executive portfolio and a fancy pen (compared with sitting at a table with a backpack, cardboard box and pencil). Study participants who had played a word-scramble game containing words about rudeness (such as “intrude” and “brazen”) interrupted a conversation sooner than participants whose game had contained words about politeness or neutral words. The same paper reported that participants who had played a word-scramble game containing words stereotypically related to the elderly (such as “knits”, “Florida” and “bingo”) walked more slowly afterward. Another study found that people who had played a word-scramble game containing words related to helpfulness were more likely to help the experimenter pick up dropped objects. Call centre employees who had seen a photo of a woman winning a race raised more money than employees who hadn’t seen it. Study participants who had done a word search puzzle containing heat-related words scored higher on a questionnaire measuring belief in global warming. Before the 2008 American election, voters who had been exposed to the Confederate flag were less willing to vote for Barack Obama. Interestingly, none of these study participants made a connection between the priming event and their later behaviour. This is only a sampling of the research out there. It appears that priming can be accomplished by seeing objects or photographs, completing puzzles containing appropriate words, answering questions about a stereotype, and even just thinking about concepts. It’s not difficult to think of ways to use this to bring the people you’re dealing with closer to the attitudes that will help achieve your goals. 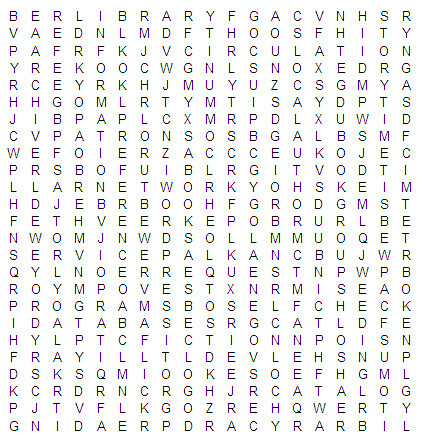 So, take a few minutes to work on the word search puzzle above. If the results of all this research can be extrapolated, you’ll feel a little more like reading a novel afterwards – or talking very quietly. And don’t blame me if you find yourself paying all those overdue book fines.